RUSH: We have climate change news. Two stories. First, New York Magazine, dated yesterday. Headline: “The Paris Climate Accords Are Starting to Look Like Fantasy.” Now, just very briefly I want to restate for you the purpose of the Paris climate accords, which of course Trump pulled out of after Obama signed us up. Well, we had not actually signed up. What Trump did was say we’re not gonna sign. Obama committed us to sign. The Paris accords were nothing. The Paris accords were a bunch of nations in the world, quote, unquote, promising to try to limit greenhouse gas emissions a specific amount per country over the next five to 10 years. And the long term objective was to limit the increase in overall global temperature to two degrees centigrade. So all these nations that are part of the Paris accords, the ChiComs, the North Koreans, the South Koreans, whoever, they each randomly picked an amount of greenhouse gas as their target. And they would see to it that their countries didn’t emit any more than their targets, but there was no penalty for failure, there was nothing hard and fast. It was just a, quote, unquote, pledge. In other words, the Paris accords were nothing. It was just a PR statement of a bunch of countries saying we’re gonna try to limit our greenhouse gas emissions over the next number of years with the objective, the goal being to limit the global temperature increase of two degrees centigrade. So the headline: “The Paris Climate Accords Are Starting to Look Like Fantasy.” Well, what this guy is realizing is that no nation has come close to meeting its promised limits on greenhouse gas emissions. Not a single one. Every nation that signed on to this foolish, worthless document has blown past whatever they claim their own limits on greenhouse emissions would be. “The International Energy Agency announced that carbon emissions grew 1.7 percent in 2017. … Even before the new spike, not a single major industrial nation was on track to fulfill the commitments it made in the Paris treaty.” This idiot fell for it! This idiot thought these countries were serious! And all it was was a PR statement to get money, donations, contributions and the like. In other words, it’s getting impossible. “We’re not gonna be able to even if we double these commitments and held to them, we won’t be able to limit the increase to two degrees. Oh, my God. The world is over.” That’s the point of the story. And this paragraph: “That is all to say, it is a virtual certainty that we will inflict…” Are you ready for this? “[I]t is a virtual certainty that we will inflict, thanks to climate change, the equivalent of 25 Holocausts on the world.” How many people died in the Holocaust? Six million. Twenty-five Holocausts are gonna result from people failing to meet their pledges in the Paris accords. This is such utter nonsense. It’s embarrassing that there are adults anywhere who literally believe this! Now, I know these clowns at the United Nations running this scam don’t believe it, but these brain-dead media people lapping all of this stuff up as though it’s legitimate? They embarrass themselves every day with their lack of curiosity, with their lack of ability to find even simple untruths. Twenty-five Holocausts? Nobody says that! So this guy of New York Magazine has just written that we’re blowing past all the limits that the nations promised at Paris. We’re blowing past it. We’re gonna have temperature rising to the point we’re gonna have 25 Holocausts. “The scare about global warming is overdone, according to more than 40 scientific papers published in just the first three months of [this year]. What their charts clearly show is that ‘nothing climatically unusual is happening,'” including warming. In fact, these 40 scientific papers say that cooling is actually what’s happening. There’s a chart here. I’m not gonna bother reading it for you. “In the chart below from a study by Polovodova et. al., we see that 20th century warming is perfectly normal in a long-term historical context. It was no warmer — indeed, is slightly cooler — than either the Roman Warm Period or the Medieval Warming Period.” In other words, 40 new scientific papers find nothing happening. There’s nothing unusual, nothing out of the ordinary. 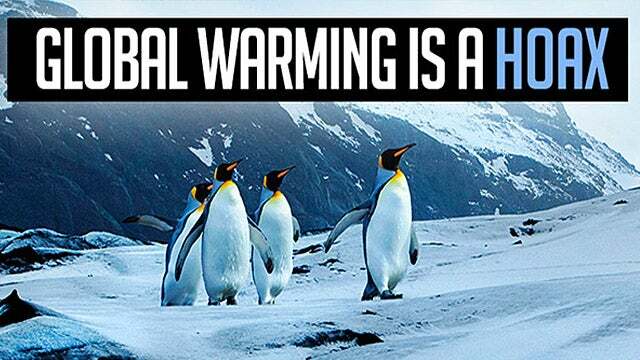 There’s no warming happening. If anything, cooling is happening. And this guy at New York Magazine is typical of the people who fall for it.